The clash of wealth and poverty in Lagos has turned physical as waterfront slums face erasure. Magdalene Aiyefoju’s son Basil has been in the mortuary for half my daughter’s life. He was shot to death by hired thugs, along with one other young man, during a September 2014 land-grab in his neighborhood. Till today, his body remains unburied while the court case seeking justice for him and his community drags on, seemingly deliberately. Aiyefoju raises her hands as she speaks about her late son, palms to the sky in a gesture I recognize as indicative of feelings of both powerlessness and hope that good will prevail. She is speaking Egun, the most commonly used language in dozens of waterfront communities in Lagos. I do not understand it, but it is clear she takes my presence in her shelter to mean some kind of willingness to grapple with the pain she is experiencing. I am struck by Aiyefoju’s surname, a Yoruba phrase meaning “the world is blind.” I, like a few other middle class Lagosians, have only recently begun to pay any meaningful attention to the forced evictions happening around the state. In light of this, her name seems an almost poetic indictment of the non-poor public’s ignorance of the sustained violence that communities like Aiyefoju’s endure in the name of development. Lagos state is well-characterized in the media as being full of contradictions and oppositional realities; it has become almost cliché to define the city-state and its massive, ever-growing population by the vast wealth and pervasive poverty that exist cheek-by-jowl. If the state government and other proponents of the “paint a positive picture” movement are to be believed, significant progress is being made to advance Lagos toward the eradication of poverty. But what is conveniently left unsaid is that the foundational idea of this “advancement” appears to be not a push to increase the economic well-being of the poor, but rather a concerted effort simply to get rid of them. Click the banner to learn the perks of supporting our journalism. This anti-poor stance is nowhere better exemplified than in the steadily shrinking or altogether vanishing fishing villages which dot the edges of the city’s lagoon, around (and in many cases, upon) which multi-million dollar property developments have sprung up within the last 20 years. One of these villages is the late Basil’s neighborhood, Otodo Gbame. Named “community in the bush” in Egun, the area was first settled by people like Aiyefoju’s forebears over a century ago. Satellite images show how the metropolis has encroached on the historical landholdings of settlements all along the waterfronts, but few (if any) residents possess the formal documentation that is used to indicate or transfer land ownership in what is now known as Lagos state. And so, it is the rights of the people of Otodo Gbame and similar communities to the land they live on that are currently — and violently — being called into question. 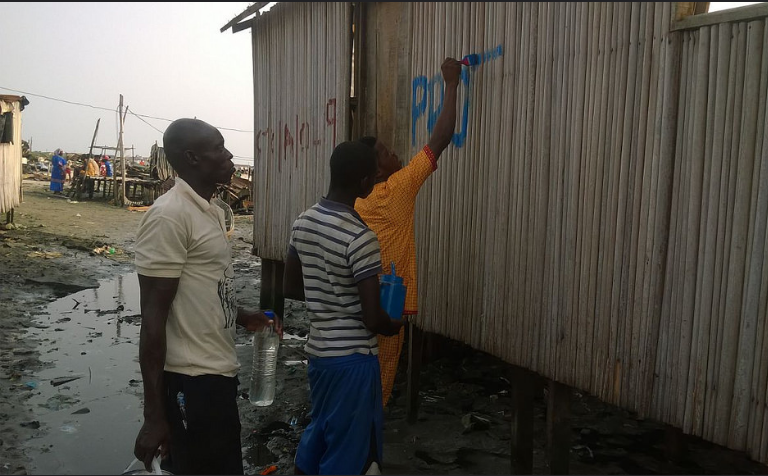 In response to the sustained forced evictions of these communities, organizations like Justice & Empowerment Initiatives (JEI), a Lagos- and Port Harcourt-based NGO focused on urban poverty and land rights, began to work within and alongside these informal settlements to provide legal training and advocacy support in conjunction with a community-based movement called the Nigerian Slum/Informal Settlement Federation. Following the February 2013 demolition that decimated much of what used to be Badia East, another informal settlement with a population of around 30,000, JEI began to train community paralegals, census-takers and mappers. 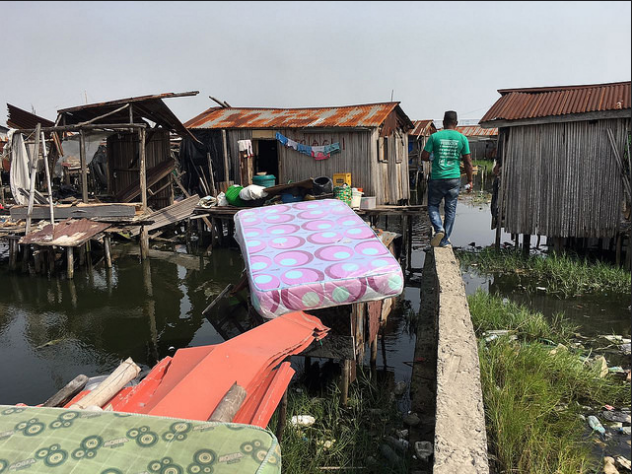 They also began legal processes that resulted in the Badia East evictees receiving a small compensation for the loss of their homes and, more recently, a court injunction against the planned demolition of all of the waterfronts across Lagos State, including Otodo Gbame. That injunction was completely disregarded in November. Having learned about the latest demolitions from the co-directors of JEI, they introduced me to Paul Kunnu, an Otodo Gbame resident. A slight, even-humored man in his late 20s, he took me into his neighborhood via a long back route, explaining that the main entrance was blocked by hoodlums hired to harass those who had refused to leave. From the shoreline, the empty multi-story developments along the community’s far borders looked completely incongruous. Much of our conversation was punctuated by the sound of gray water lapping around the bases of jetties the local fishermen had built, a soothing rhythm that belied the many scorched, dismantled bamboo walls listing into the lagoon. Behind us, shelters of salvaged wood and canvas protected the remaining residents from the sun. Stacked high with debris, the cracked tile floors of what used to be a Methodist church, an Evangelical church, a white garment church, and a primary school border the smaller football field. The broken concrete walls of the homes of those who chose to invest in more durable building materials lie lopsidedly atop one another, a testament to the decimation of any increases in disposable income some residents may have experienced. The only buildings left almost intact are in a small huddle to the left of the community’s central area—overcrowded homes standing over water made brackish by the unlawful fencing, dredging and sand-filling of these same land grabbers over the last two years. “They would come and build fences around the houses, then say that the land inside is their own and tell us to leave there,” Kunnu said. “This time, they arrested 23 of our leaders two days before they came. The strong people, those they knew would not allow them to continue, they took all of them away.” Baale, one of Otodo Gbame’s most prominent leaders, was not released until Nov. 24, two weeks after the demolition. Kunnu himself has been detained on two occasions: once for trying to persuade police officers to obey the court injunction protecting his community and, some two weeks after I met him, on a trumped up murder charge. The charge was laid against a small group of vocal community members at an investigation by an Abuja-based federal agency into the role of the Elegushi family in the demolition. At his first arrest, Kunnu was released after being warned never to show his face in his community again. The second time around, the directors of JEI had to solicit the intervention of the Deputy Inspector General of Police to secure his release. There is something to be said for the resilience of the people of Otodo Gbame. The day I visited, many of the remaining residents sat in groups of varying sizes in shelters built on charred foundations, talking about something they had been told they had no right to: a future on the land they had always known as home. Kunnu introduced me to the largest one, a group of about 20 men who nodded and murmured in assent as he recounted more details of the attempted eviction. The absence of rancor in his voice might have been the result of having to repeat the same story over and over to visitors like myself, and as he spoke I considered what it must be like to live under the kind of conditions which could render a story as harrowing as theirs almost ordinary to its teller. The question of who “they” are is anybody’s guess. 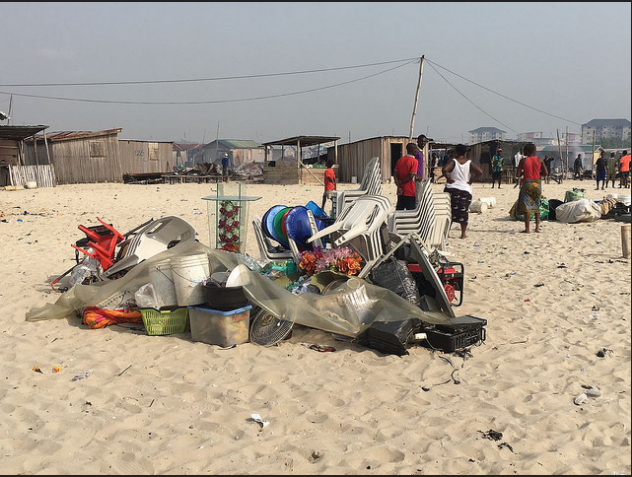 The state government has denied involvement, but Lagos Governor Akinwunmi Ambode on Oct. 9 announced intentions to destroy all informal waterfront settlements across the state. 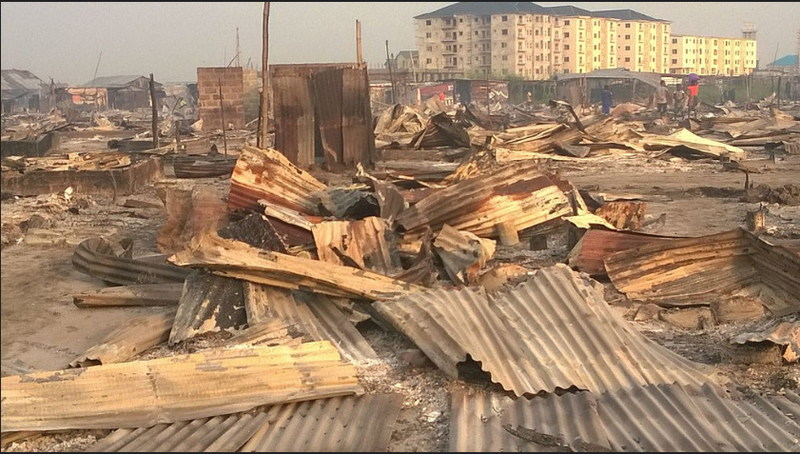 Witnesses said police personnel facilitated the Nov. 9 demolition by setting fires and preventing efforts to put them out, and the Lagos State Building Control Agency under the Ministry of Physical Planning confirmed their participation in the demolition. 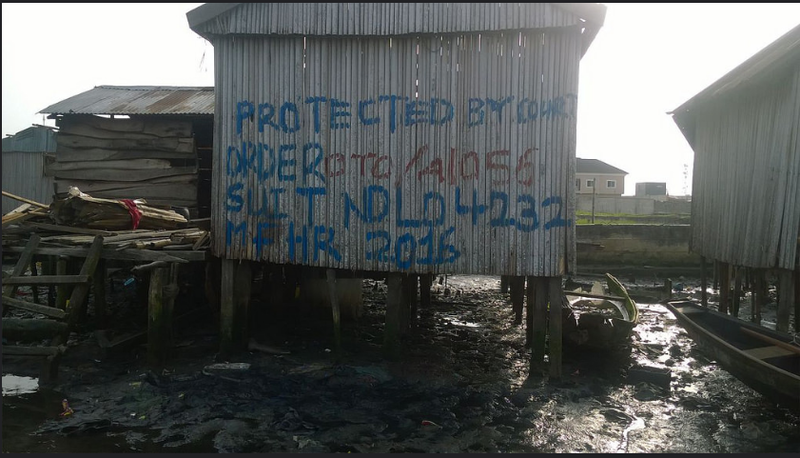 The Elegushi, the wealthy family that claims ownership of much of the waterfront in the Lekki area, have also distanced themselves in a contradictory move: Notices back-dated to Nov. 11 were painted on a few buildings on Nov. 22, falsely claiming that the family had legal backing to take over the land. This action automatically implicates them while also potentially making them liable for perjury due to the court procedure they wrongfully used. His voice trailed off, but I understood what was unsaid. Now, there is money to be made from prime waterfront property, and historical friendship or current well-being are inconveniences easily brushed aside. Aiyefoju’s son’s death and the other happenings in Otodo Gbame are, sadly, fairly typical of the treatment endured by Lagosians whose lives are conducted along the lines of what the state considers “informal.” This, despite such people making up more than a third of the state’s entire population and contributing vital services, including food production, waste management and artisanal labor, to the state’s economy. The argument often deployed, particularly against the people living in the fishing settlements, is that they have no right to be there. But one wonders: How can you meet someone somewhere, then decide that it is they who do not belong there? This article was completed on Dec. 10, 2016. Many thanks to Paul Kunnu, Megan Chapman and Andrew Maki of Justice and Empowerment Initiatives. More footage of the demolition can be found here. Get the latest print edition delivered to your door! Click the banner to order now.